Meet Sonny Anderson. When he turns 21 he travels from California to the UK to leave a troubled past behind, reunite with his mother and finally learn the truth about his childhood. But is it a truth he wants to hear? Martine McDonagh is the author of two acclaimed novels, I Have Waited, and You Have Come and After Phoenix. She wrote her first story at age 8 while growing up in the grounds of a psychiatric hospital, and carried on writing throughout her 30-year career in the music industry as an artist manager (to James, Fujiya & Miyagi, and others). I loved this novel and it’s still with me. A true must-read, and can’t put it down! A truly visual read, journeying through the process of a young mans unknown history. We are victims of victims and are not alone in our anger, grief and sewage. Sonny said what I had always wanted to say to my mum. Read it, let it work its magic and set you free. his road trip is a pleasure. Every time I had to put it down I couldn’t wait until I could pick it up again. A unique voice, I love this author and found this book fascinating. People and families are so weird and Martine McDonagh really writes so well about that, she also writes about teenage expectation and disappointment so well in this book particularly, I really hope she wins. a lovely and thought-provoking read. It’s not often that I read a book more than once. Narcissism for Beginners was such a terrific book that I raced through it. I didn’t want it be over so I read it again. It’s clever and well-written. So worthy of recognition. So worthy of reading it more than once. an original protagonist. a satisfying read. So excited for Martine. Absolutely deserves this. Absolutely loved this book. Beautifully written, incredibly funny, poignant and just overall one of the best books I’ve read in the last few years! My favourite book of 2017 and the story still stays with me. Amazingly well written, so funny and so sad. A beautiful book by a beautiful lady. Sonny lives on in my mind, angry and funny, an excellent read. A sentimental trail of learning and truth. Can’t wait for the sequel! A brilliant piece of contemporary literary ventriloquilism. Sonny’s voice had me from first page to last. Loved this book. Captures you from the first Page and doesn’t let go. My favourite author, love her books. Clever book, funny and good writing. Really enjoyed it. A masterclass in characterisation and story telling. Brilliant novel! Well written lovely human story – recommended to all . Best book I’ve read in ages. A very convincing portrayal of the inside of a teenage boy’s head. I don’t know how she does it! Great book – great author. In the spirit of Catcher in the Rye this books inhabits its leading character with convincing clarity. I very much enjoyed the protagonist’s ironic take on life, the universe and everything. He reminded me too of Holden Caulfield in Salinger’s “Catcher in the Rye.” Brilliant. Read this a while back and absolutely loved it. Whizzed through it in a day and still remember it now. Martine McDonagh Does not disappoint!!!! Original, compelling and beautifully written. Highly recommended read. I love the pace and quirky narrative of this book – loving every minute of it – definitely deserves to win this! A brilliant performance, in a voice that captures the strains in the main character. Ordinary, but not in the least ordinary. One you’ll want to read in a sitting. A wonderfully written, funny, thought provoking, affecting book. I read it again as soon as I’d finished it. A story not quite like any other. Intelligent and fun. Great characterisation. Each chapter leaves you wanting the next chapter. Love this book – touching, fun, fast-paced, quirky, surprising and very close to the bone. Great to read something that addresses a serious issue without making it a labour to read, rather a joy! A master class in characterisation. Moving. Outstandingly smart. A must read. It deserves to win the People’s Book Prize. A niche that needed to be filled is. Sonny’s parents are long since out of his life but he’s sort of done okay with his quirky guardian. 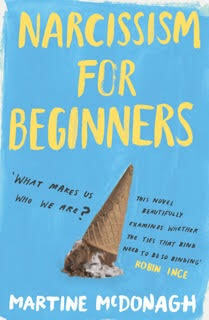 As a beginner at adulthood he takes a sudden, unplanned trip and gets to grips with what they were and mean to him through the stories of others. Excellent, dry writing and affecting characterisation. A book that I’ll never forget. Amazing! Illuminating and insightful about family and the unfolding dynamics of growth within it. Martine McDonagh has a gift for putting into words the feelings that lie buried beneath the surface of our emotions. A beautiful read by an author that mor deserve to know. Really enjoyed reading this book . A wonderfully offbeat quest for answers, a young man’s stumble around Britain in search of his family, which poses the question of just what a family is – the people who make us, the ones who raise us or those we choose to have in our lives. Told with a real lightness of touch, this is a sad yet also very funny coming-of-age road trip which is well worth your time taking.